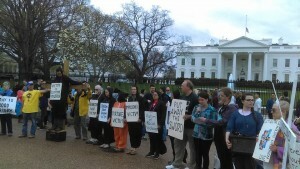 On Good Friday, a nonviolent public witness was held at the Pentagon. At 7:00 a.m. the community processed from Army-Navy Dr. to the police designated protest zone with signs and small crosses with the names of different victims in our society and world written on them. During the procession, the Loras students led us in singing “Let Me Be An Instrument Of Peace.” As hundreds of Pentagon employees streamed into work and numerous police were on hand, four of our community remained on the Pentagon sidewalk (where we are subject to arrest) and processed toward the building carrying a cross with the inscription: “Suffering Humanity – 2016,” and a sign that said “Put Away the Sword.” As they processed, they were able to kneel and pray three times the traditional prayer of Good Friday “We Adore You O Christ and We Bless You, Because By Your Holy Cross You Have Redeemed the World,” followed by a plea “Put Away the Sword!” Surprisingly, they were not immediately stopped by police and they were able to go halfway down the sidewalk before they were arrested. After about ten minutes, those who were praying on the sidewalk were arrested, taken to the Pentagon Police processing center, and released after several hours. They were charged with “failure to comply with a lawful order” and given a violation notice to appear in U.S. District Court in Alexandria, Virginia on May 19, 2016. 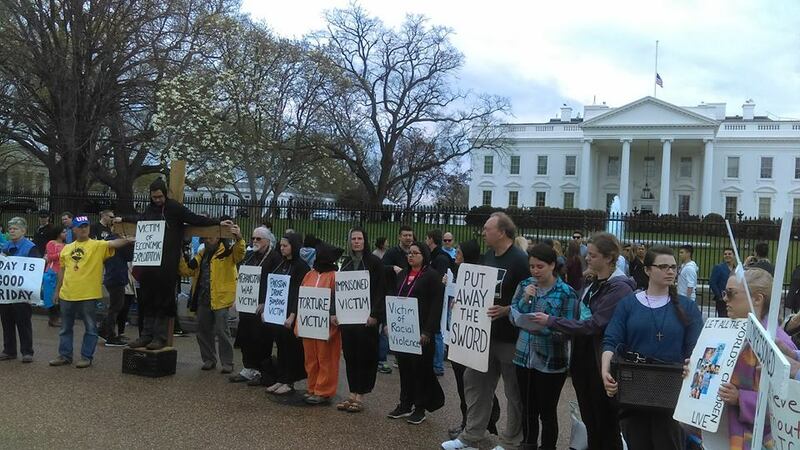 At noon-time, we were joined by other friends from the wider D.C. peace community as we held a “contemporary crucifixion” on Pennsylvania Ave. directly in front of the White House, as hundreds of tourists looked on. See below the reflections that were read for each of the eleven crucified victims as they, wearing black robes, took turns standing on a crate, with arms outstretched on the cross. After each victim came off the cross we sang: “Were you there when they crucified my Lord.” Our leaflet was also read to begin the witness, and a reading about how Jesus is being crucified today, by Leonardo Boff, was offered to conclude it. The Loras students began and ended the witness with singing “Let Me Be An Instrument of Peace.” We ended our witness and retreat by sharing a sign of peace.